Have you ever forgiven someone just so you could move on? Have you ever extended mercy simply so you didn’t have to have the other person’s action weighing heavy on your heart anymore? I’ve already talked about forgiveness and what a relief and healing it can bring us. And I think that the more Christians practice this, the more they see how much forgiveness can make themselves feel better too! So why does God forgive us? Is it because He loves us? Yup (John 3:16). Is it because He is rich in mercy? You got it (Ephesians 2:4). But there’s also another reason why God wants us to accept Jesus and receive forgiveness for our sins: It makes Him feel good too. I, even I, am he that blotteth out thy transgressions for mine own sake, and will not remember thy sins (Isaiah 43:25 KJV). God lays it all out right here…He not only forgives us because He loves us, but He also does it for His own sake. No human being is perfect–and with all of the children God has who sin every single day, that must lay pretty darn heavy on His heart. No wonder He is so quick to forgive! That just shows us how awesome God is, and how much He can actually relate to us. I found this scripture by accident as I was flipping through Isaiah, and the Holy Spirit showed me the power of this verse (I love it when this happens). God teaches us a lot about forgiveness. Not only is God quick to forgive, but He also models how forgiveness can change lives–just look at Jesus! I hope this is encouragement for you to have the confidence to kneel before God to ask for His help in anything. 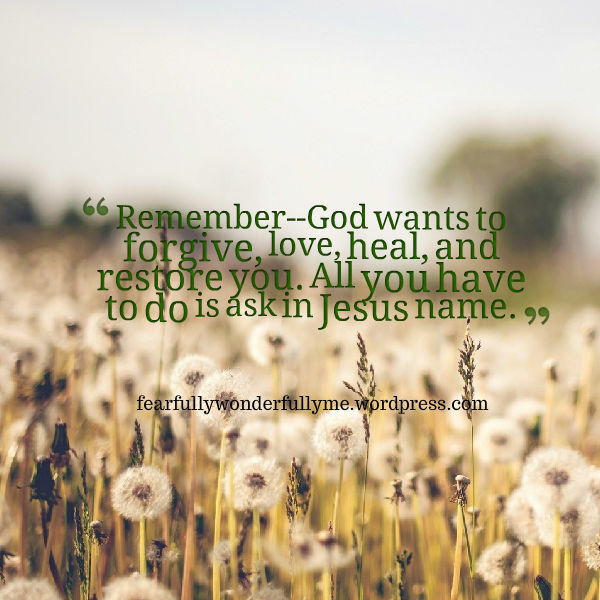 Remember–God wants to forgive, love, heal, and restore you. All you have to do is ask in Jesus name.